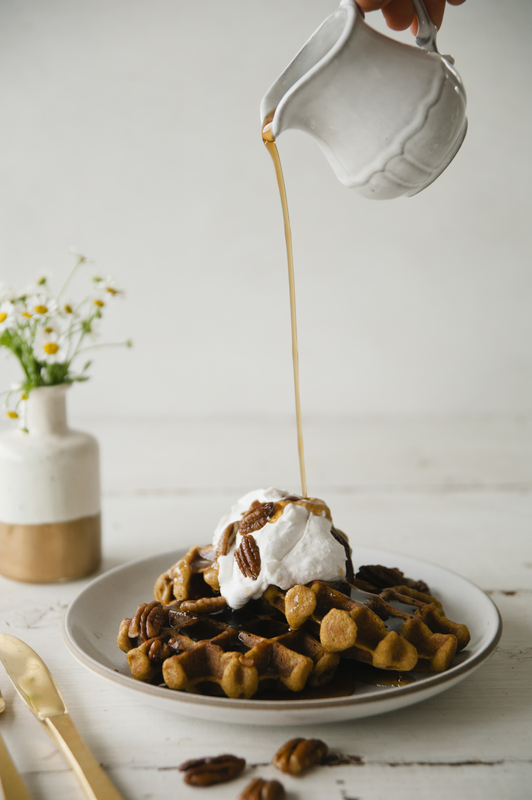 My latest obsession: waffles. 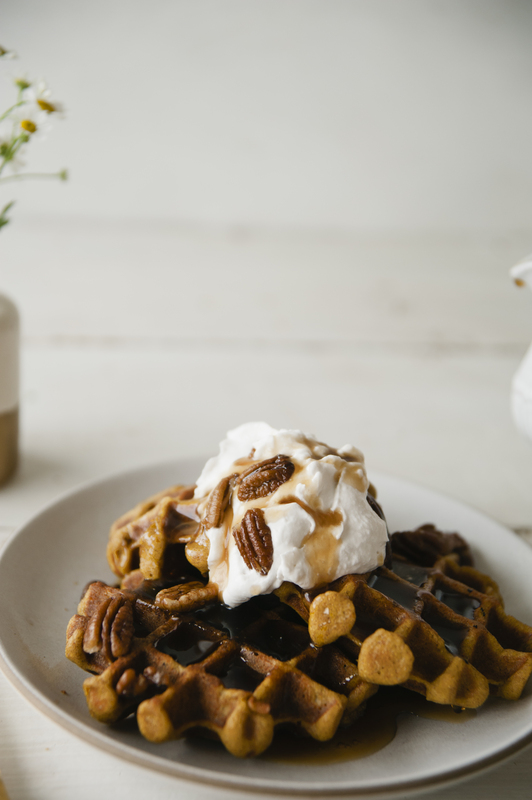 Last Spring, we brought you our delicious Strawberry Shortcake Waffles, and this Fall, we introduce our Pumpkin Waffles! 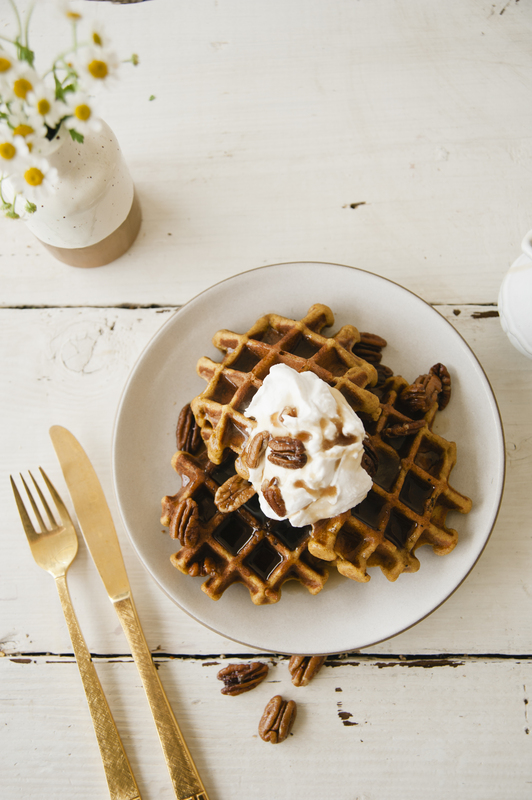 These waffles are flavor filled and topped with our candied pecans and coconut whipped cream, a decadent breakfast treat. Prepare waffle iron by smoothing coconut oil over grid surface. Heat waffle iron. Mix almond flour, cassava flour, baking soda, cinnamon and salt in a bowl. Add eggs, pumpkin puree, coconut milk, and vanilla extract. Using a whisk, mix batter well. Using an ice cream scooper, for less messy batter transfer, scoop about 2 -3 tablespoons of batter onto hot iron. Close waffle iron. Heat to desired texture. My husband like crispy waffles, so I keep my waffle iron on a level 5. For softer waffles, heat to 3 or 4. Combine all ingredients in a bowl and toss gently. Pour contents into pan and bake about 10 minutes. Allow to cool for about 30 minutes. Using a spatula, gently scrape nuts from pan, and place in an airtight jar. Walnuts will keep for 2-3 days. Enjoy! 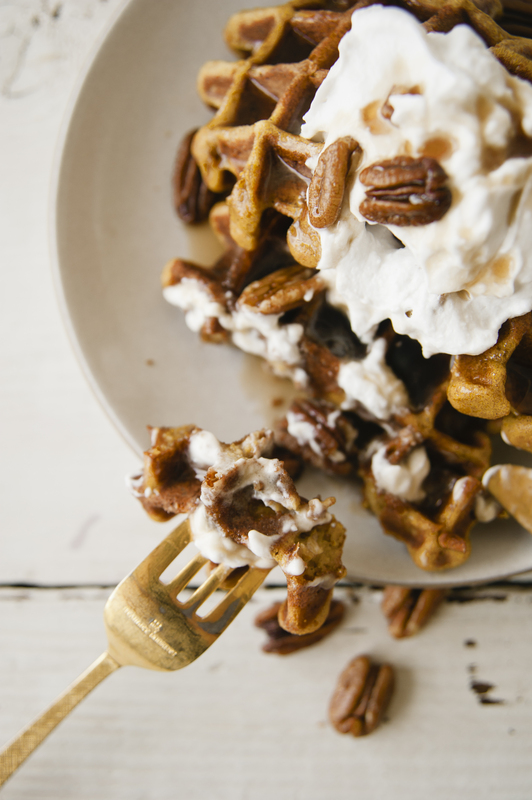 Top waffles with candied pecans, coconut whipped cream, and of course, maple syrup! Enjoy! 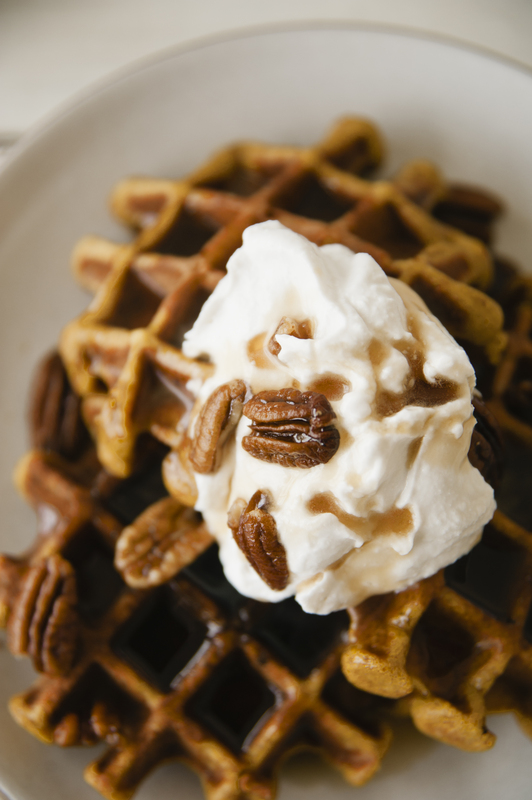 This entry was posted in breakfast, brunch, dinner, Uncategorized and tagged almond flour, autumn, candied pecans, cassava flour, coconut cream, coconut milk, coconut oil, coconut whipped cream, dairy free, delicious, fall favorite, gluten free, himalayan pink salt, holidays, maple syrup, pecans, pumpkin puree, pumpkin waffles, refined sugar free, sweet laurel bakery, treat, waffles on November 11, 2016 by sweetlaurel. 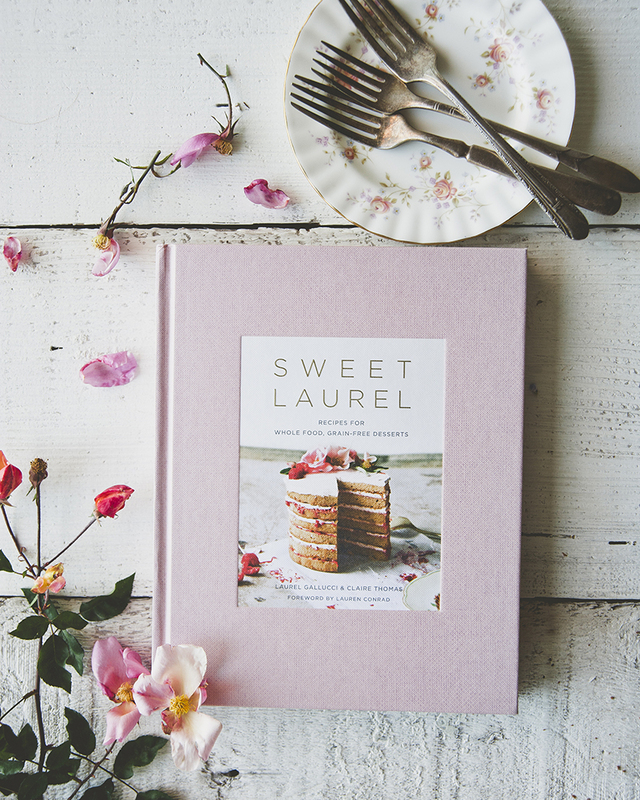 These look amazing and I love that you’re using cassava–it’s so good! Do you think they would work ok with flax eggs? And maybe subbing banana for the pumpkin?